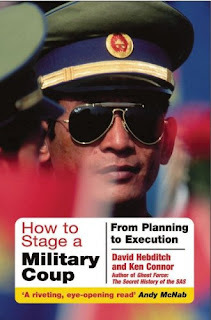 A mishmash of half-baked ideas, How To Stage A Military Coup is an incompetently written, ploddingly constructed book that promises little and achieves less. Authors David Hebditch and Ken Connor had four incomplete concepts between them: a history of coup d'etats; a fictional story about a preposterous military takeover of England; random stories from Britain's Special Air Service (SAS); and an examination of why and how military coups are planned and executed. Obviously incapable of developing any of these ideas into a meaningful book, they are mashed together into a frightful jumble. So the fictional military coup in England occupies the first few pages of every chapter and then just...ends with no apparent resolution. The hows and whens of planning and staging a coup are described sometimes with attempted humour, and other times with apparent seriousness, to the level of referring to actual websites for various resources. None of it holds together as a cohesive narrative, and some of the ideas, such as leaders needing to stay at home at all times to avoid being overthrown, are both inane and repeated about every 10 pages. The tidbits from SAS training exercises are sprinkled throughout the book with no rhyme or reason, without any relevant context to the rest of the book, and without purpose. The histories of various coups are somewhat readable, with the discussion of the UK / US - backed Iran coup of 1953 and the US - supported Chile coup in 1973 providing some points of interest. But then countries like Fiji and Equatorial Guinea take over large chunks of the book, with Hebditch and Connor displaying an unhealthy and detailed obsession with the endless coups, counter-coups, and attempted coups plotted by thick-necked strong men and ill-prepared mercenaries in largely irrelevant countries. How To Stage a Military Coup tries to do too many things at once, and fails fairly miserably at all of them. Subtitled "From Planning To Execution". 197 pages, plus Appendices, Notes and Index. Published in softcover by Frontline Books.